Key difference: An enzyme is a highly selective catalyst that greatly accelerates both the rate and specificity of metabolic reactions. A hormone, on the other hand, is a chemical released by a cell or a gland in one part of the body that sends out messages that affect cells in other parts of the organism. Enzymes and hormones are both types of chemical compounds that are present in the body. They each have a specific purpose in the body. An enzyme is a highly selective catalyst that greatly accelerates both the rate and specificity of metabolic reactions. A hormone, on the other hand, is a chemical released by a cell or a gland in one part of the body that sends out messages that affect cells in other parts of the organism. Enzymes are large biological molecules that are responsible for the thousands of chemical inter-conversions happening simultaneously in a body. They are released by glands like pancreas, liver, gallbladder etc. Their main function is to serve as a catalyst for accelerating both the rate and specificity of metabolic reactions, such as digestion of food or the synthesis of DNA. A catalyst effects a chemical reaction by accelerating it but remains chemically unchanged themselves. Most enzymes are made up of protein, however some are RNA molecules. In addition to accelerating, enzymes exert further control on the reactions. Enzymes allow reactions to take place at moderate temperatures, such as 37° C (98.6° F) in humans. They also allow the reactions to be turned on and off as needed. Furthermore, the do not produce any unnecessary side products, unlike most spontaneous reactions. Almost all chemical reactions in a biological cell need enzymes in order to occur at rates sufficient for life. However, enzyme activity can be affected by other molecules, as well as temperature, pressure, chemical environment (e.g. pH), and the concentration of substrate (ingredient of the reaction). Many drugs and poisons also slow down enzyme activity. 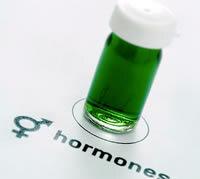 A hormone is a chemical released by a cell or a gland. Hormones are a chemical messenger whose function is to transport a signal from one cell to another. It sends out messages that affect cells in other parts of the organism. A little amount of hormone can effectively change cell metabolism. All multicellular organisms produce hormones. Hormones are produced by specific organs of the body like adrenal glands, pituitary glands, pancreas, etc. They are directly released into the blood stream and each one is released for a specific purpose. Cells essentially respond to a hormone when they express a specific receptor for that hormone. The hormone binds to the receptor protein, resulting in the activation of a signal transduction mechanism that ultimately leads to cell type-specific responses. An example for hormone related activity includes: the TSH hormone released by the pituitary gland in the brain that targets the thyroid gland in the neck making it to produce thyroid hormones. There are many various hormones targeting specific organs. The hormone-producing glands compose the body’s endocrine system and influence four basic categories of vertebrate physiology. These are the sexual development and reproduction, growth and development of tissues and organs, regulation of available energy and heat, and regulation of the body’s internal balance between concentrations of water and ions. Basically, hormones act like a messenger of information that regulate the timing and speed of the processes that take place in the body. However, unlike enzymes, hormones don’t actually take part in the chemical processes; they just provide the instructions that the processes are required. Also, hormones are capable of traveling via the bloodstream, which is how the TSH hormone released in the brain can target the thyroid gland in the neck. This is also unlike enzymes, which stay inside the cell that they are released, managing the reactions in the cell itself. just good.............. but something is better than nothing.........!!!!!!!!! !